Specialised cleaning, stripping & sealing, regrouting and repair solutions for all types of stone and tile. I was asked to visit an old house from the Victorian era in Cleckheaton which is part of the West Yorkshire district of Kirklees and only 14 miles from my base in Oxenhope. The owners had bought the house last year and had been renovating it ever since. 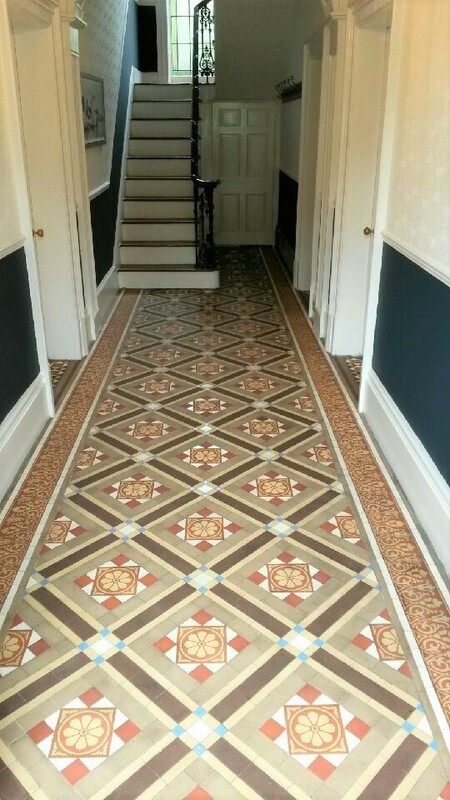 The last job was to sort out the Victorian tiled hallway that they knew from the previous owners had been covered by carpet for over 50 years. Leaving the floor restoration until last was a sensible decision as the last thing you need is for a decorator to drip paint over your recently renovated floor. I could see the floor was in good physical condition but had layers of dirt, old sealant and of course paint splashes on it but after doing a test clean I knew that we could bring it back to life and return it to something like its former glory. The test clean is an important part of our survey as it gives the customer confidence we know what we’re talking about and it gives me a chance to work out the best way of cleaning the floor, so I can provide a more accurate quotation (see below). 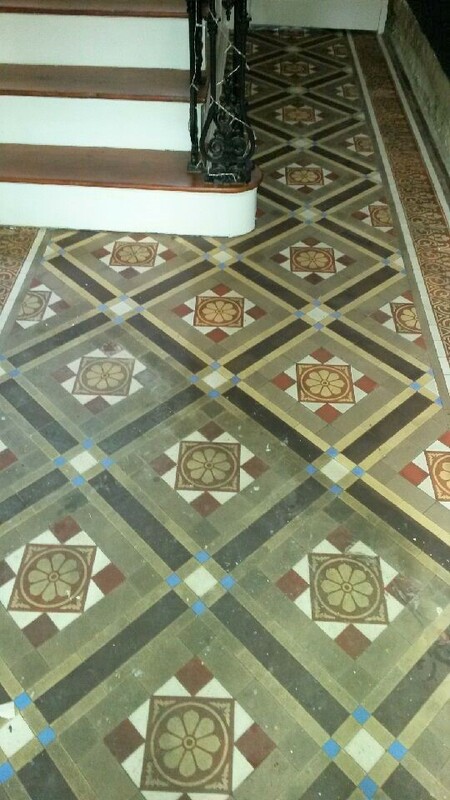 The owner of the property was impressed with the results of the test clean and keen to have the full potential of the Victorian tiled floor revealed booked me in to do a full clean and seal. Normally, we would clean these floors using our rotary machines and chemicals to break down the layers of dirt but in this instance that was not going to be effective. I worked this out during the test clean where I discovered that the tiles were very porous so that any liquid that was put on the floor was immediately absorbed into it. This meant that any chemicals that I applied to the floor did not have time to work before they were absorbed into the floor. When these floors were originally laid there was no damp-proof membrane laid underneath which leaves them very susceptible to damp issues and salting from efflorescence. 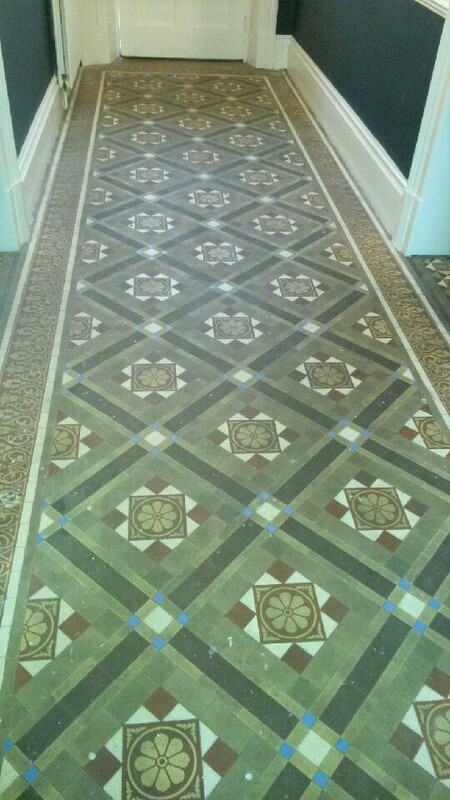 After trying a couple of different methods, I decided that the only way to get this floor clean was to use handheld diamond blocks and a small amount of water to clean the floor in very small sections at a time and then immediately remove the residue before it dried back into the floor. This was obviously very time consuming but did remove the dirt very effectively, it also meant that I wouldn’t exacerbate any efflorescence issues which could happen when excessive amounts of water are used. Once the whole floor was clean it was given an Acid Wash with Tile Doctor Acid Gel to neutralise any potential salting issues. The gel was then rinsed off with water and extracted using a wet vacuum to remove as much moisture as possible from the floor. The now clean floor was then left to dry off thoroughly, so it would be ready for sealing. A couple of days later I returned and started by checking the moisture levels in a couple of areas to verify that the tiles were dry enough to be sealed. All was well and so I proceeded to seal the floor with a couple of coats of Tile Doctor Colour Grow which is an impregnating sealer that seeps into the pores of the tile protecting it from within. Colour Grow is also a colour enhancing sealer that improves the natural colours in the tile and most importantly it’s a breathable sealer that will allows any moisture rising through the tile to evaporate. Using a breathable sealer is highly recommended for floors with no damp-proof membrane as moisture can become trapped under the tile which over time can cause damp to rise through the walls and even tiles to become loose. The Customers were very impressed by the transformation in their floor and hopefully you can see from the photos how much of a difference that has been made to the floor.